Lavender oil can actually make the skin redder. Lavender oil smells good and is useful for treating burns. For most people who have acne, however, lavender oil makes the skin redder. Many acne care products contain lavender oil. You may be able to tolerate lavender oil by itself, but have a problem when it is combined with other essential oils or botanicals. Lavender oil seems to be interfere with the way the male body uses testosterone, but serious consequences have only been noted in three pre-adolescent boys. Lavender is a plant that grows wild over much of Asia, Europe, and Africa. It has been planted in gardens all over the world, and it is cultivated for production of essential oils for healing and perfumery in France, Utah, and Texas. As a medicinal herb, lavender is used to treat anxiety, headaches, and painful burns. It is also used to treat acne, but this is almost never a good idea. How Does Lavender Act on the Skin? The essential oils of lavender bind to fats on the surface of the skin. If lavender oil gets inside a pore, it is likely to remain there, even after the skin is washed, unless it is washed with an oil-based cleanser. Lavender interacts with the autonomic nervous system, the nerves that control the “automatic” functions of the body. In the skin, there are nerves that are excited when the skin is irritated. They release a compound called corticotrophin releasing hormone, or CRH. This hormone stimulates the release of histamine, the chemical that triggers allergic reactions. When the skin has been burned, releasing histamine is a good thing. The chemical blocks off the tissue that has been burned. Lavender is also carminative, relaxing the muscles around blood vessels so that they deliver more blood to the face. The extra flow of blood reddens the skin, but this effect is not noticeable, because the skin has already been reddened even more by the burn. Applying lavender to skin affected by acne, however, makes the condition worse. The relaxation of the smooth muscles around blood vessels actually can trigger an outbreak of rosacea. And in mild to moderate common acne, it can make pimples look redder and more prominent. Exposing the skin to the UV-A rays of the sun after application of lavender increases the amount of time it stays in the skin. If the skin is not exposed to the sun, the active chemicals in lavender oil begin to break down after about 4 hours, although it may take several days for every trace of lavender oil to leave the skin. 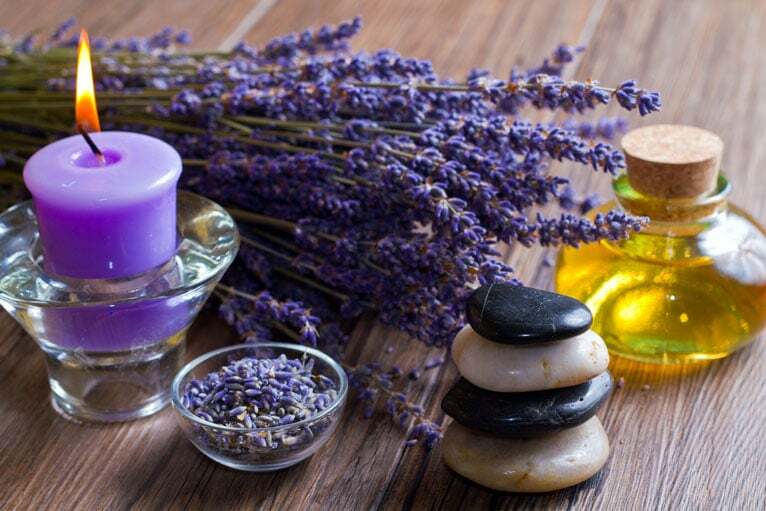 Which Products Contain Lavender Oil? If My Acne Skin Care Product Contains Lavender, Should I Return It for a Refund? Not everyone’s skin responds to lavender oil with equal intensity. If you have irritation-resistant oily skin, you may be able to tolerate occasional use of products with lavender oil with no problems. If you have irritation-prone dry skin, however, probably you should avoid all skin care products of any kind that contain lavender oil, linalool, or linalyl acetate. Sometimes you might be able to tolerate a little bit of lavender added to a product to make it smell nice, except it also contains arnica, boldo, chamomile, cinnamon, eugenol, frankincense, mint, peppermint, menthol, wintergreen, rose, tea tree oil, or vanilla. And the combination of any of these ingredients with cocoa butter or products that contain isopropyl isostearate, isopropyl myristate, or sodium laurel sulfate can cause blemishes to break out, especially around the eyes and mouth. If you have any kind of irritation, inflammation, or sensitivity of any kind on your skin, it is best not to use products that contain lavender oil. A drop on your forehead to stop a headache, lavender in cookies or tea, or lavender capsules for allergies are all OK, just keep lavender off your skin. Does Lavender Oil Disrupt Estrogen and Testosterone Balance? A clinical report in the prestigious New England Journal of Medicine started a rumor that lavender oil contains estrogen and can cause feminizing effects in men and premenstrual tension in women. This is not true. The New England Journal of Medicine reported and analyzed the cases of three boys, none of whom had entered puberty, who had gynecomastia, or enlargement of the breasts. Gynecomastia is not unusual in teenaged boys who have entered puberty. It is very rare in boys who have not yet experienced puberty. The boys were very carefully examined for any factors that could have caused these unusual symptoms. It was found that two of the boys had been exposed to a soap that contains lavender, and the third had been exposed to a soap that contains lavender and tea tree oil. In all three boys, the unusual breast swelling ended after use of the soaps was continued. Does this mean that lavender contains compounds that act like estrogen or that block the action of testosterone? Further research indicates that this is possible, but if you are not a pre-adolescent boy, the effect seems to be of limited importance. However, no products that contain lavender oil are a first choice for treating blemished skin. What about applying Lavendar essential oil to Rosacea ?